Breaking the Ice is a light-hearted read by Julie Cross and is a part of the Juniper Falls series. Our MC’s are Haley Stevenson and Fletcher Scott, both great characters but they couldn’t be any more different. Haley is the Princess of Juniper Falls and is involved in everything, she is a sweetheart but also quite a sticky beak. Fletcher has quite a few secrets, he’s reserved, nerdy and doesn’t like anyone to know his business; they complimented each other well but their interactions at times did drive me completely crazy! The plot is quite predictable; Haley is struggling academically so she takes her civics class during summer school, this is where she learns more about Fletcher and inserts herself into his life to improve her GPA. Fletcher loves hockey and yearns for less bench time and more time on the ice but with his health issues it hasn’t been a possibility. This book was entertaining and was without all the unnecessary YA angst. The romance was done well but there was a lot of push and pull and no clearly defined relationship between them but Haley knew upfront that Fletcher wasn't a committed sort of guy; they complimented each other well and communicated in a way which didn't leave room for miscommunication which I liked but I would have liked a few more mushy, romantic scenes between them, I felt like the ending was very rushed for them. All of the side characters were wonderful! I do hope we see more of them in the next books, especially Jamie. Julie Cross’s writing is great and there quite a few laugh out loud moments but I did also find that there were parts of the book where I found myself skimming. Breaking the Ice is also the second book in the series but it can most definitely be read as a stand-alone, I never at all felt lost. 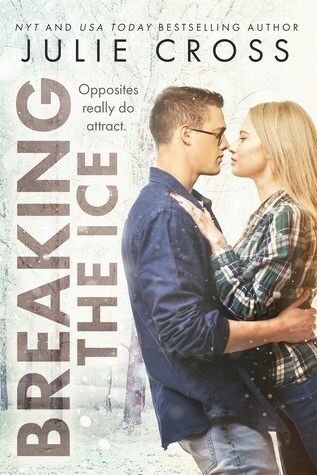 Thank you to Entangled Teen via Netgalley for the opportunity to read and review Breaking the Ice. About the author: Julie Cross is a NYT and USA Today bestselling author of New Adult and Young Adult fiction, including the Tempest series, a young adult science fiction trilogy which includes Tempest, Vortex, Timestorm (St. Martin's Press). She's also the author of Letters to Nowhere series, Whatever Life Throws at You, Third Degree, Halfway Perfect, and many more to come! Julie lives in Central Illinois with her husband and three children. She's a former gymnast, longtime gymnastics fan, coach and former Gymnastics Program Director with the YMCA. Shes a lover of books, devouring several novels a week, especially in the young adult and new adult genres. Great review Sharon, I know what you mean about the romance. I read a few books bu this author and liked them. I have this one on my list as well, sad you didnt love it.